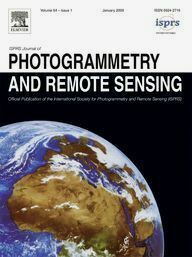 The ISPRS Journal of Photogrammetry and Remote Sensing is the official journal of the International Society for Photogrammetry and Remote Sensing (ISPRS). The journal is to provide a channel of communication for scientists and professionals in all countries working in the many disciplines employing photogrammetry, remote sensing, spatial information systems, computer vision, and other related fields. The journal is designed to serve as a source reference and archive of advancements in these disciplines. The journal's objective is to publish high quality, peer-reviewed, preferably previously unpublished papers of a scientific/research, technological development or application/practical nature. The journal will publish papers, including those based on ISPRS meeting presentations, which are regarded as significant contributions in the above mentioned fields. We especially encourage papers: of broad scientific interest; on innovative applications, particularly in new fields; of an interdisciplinary nature; on topics that have not been dealt with (or to a small degree) by the ISPRS Journal or related journals; and on topics related to new possible scientific/professional directions. Preferably, theoretical papers should include applications, and papers dealing with systems and applications should include theoretical background. The ISPRS Journal of Photogrammetry and Remote Sensing is published by Elsevier in twelve volumes per year. Table of Contents (ToC) service (incl. paper titles, authors and abstracts for the current and the four last years). Full-text of the papers is also electronically available for all members of hardcopy institutional subscribers (i.e. if your library has registred for the journal via ScienceDirect Web Editions). Manuscript Status. Allows authors to track their paper after getting the proofs. Detailed subscription information for the ISPRS Journal can be found here. Please follow the instructions for authors for the preparation of your paper. Template files created by Elsevier are available for Microsoft Word and LaTeX. Note that submitted papers should be formatted in one column and with double line spacing. Papers should be submitted electronically using the Elsevier Editorial System (EES) at http://ees.elsevier.com/photo. First time users will first need to create a profile at this web address and obtain a username and password. Authors should then submit all text-processing files, i.e. one Word file with all information included and files for figures, or one LaTeX file together with all style files, bibliography files and Postscript files for the figures. Authors are advised to only submit a PDF file in case the automatic PDF generation fails. for your reference list. You do not need to upload elsarticle.cls and elsarticle-harv.bst to EES. Authors needing help with paper editing, linguistic corrections and proof reading can make use of Elsevier's language editing services. Global Land Cover Mapping and Monitoring. Guest editors: Yifang Ban (KTH Royal Institute of Technology, Stockholm, Sweden), Peng Gong (Tsinghua University, Beijing, China) and Chandra Giri (Duke University, Durham, NC, USA), Published in volume 103, May 2015. High-Resolution Earth Imaging for Geospatial Information. Guest editors: Christian Heipke (Leibniz Universität Hannover, Germany), Uwe Soergel (Technical University of Darmstadt), Franz Rottensteiner (Leibniz Universität Hannover, Germany), Boris Jutzi (Karlsruhe Institute of Technology, Germany), Published in volume 100, February 2015. Guest editors: Fabio Remondino(FBK – Bruno Kessler Foundation, Italy), and Jan Boehm (University College London, United Kingdom). Published in volume 76, February 2013. Innovative Applications of SAR Interferometry from modern Satellite Sensors. Guest editors: Uwe Soergel (Leibniz Universität Hannover, Germany), Rudiger Gens (Alaska Satellite Facility, U.S.A.), and Michele Crosetto (Institute of Geomatics, Spain). Published in volume 73, September 2012. Advancements in LiDAR data processing and applications. Guest editors: Frédéric Bretar (CETE NC/LRPC, France), Wolfgang Wagner (Vienna University of Technology, Austria), and Nicolas Paparoditis (Institut Géographique National, France). Published in volume 66, issue 6 Supplement, December 2011. Scale, quality, and analysis aspects of city models. Guest editors: Monika Sester (Leibniz University Hannover, Germany), Lars Harrie (Lund University, Sweden), and Alfred Stein (International Institute for Geoinformation Science and Earth Observation (ITC), the Netherlands). Published in volume 66, issue 2, March 2011. Guest editors: Norbert Pfeifer (Technical University of Vienna, Austria), Helmut Mayer (Bundeswehr University, Germany), and Juha Hyyppä (Finnish Geodetic Institute). Published in volume 65, issue 6, November 2010. Visualization and Exploration of Geospatial Data. Guest editors: Jochen Schiewe (University of Osnabrueck, Germany) and Marguerite Madden (The University of Georgia, U.S.A.). Published in volume 65, issue 3, May 2010. Mapping with SAR - Techniques and Applications. Guest editors: Andreas Reigber (Berlin University of Technology, Germany) and Laurent Ferro-Famil (University of Rennes 1, France). Published in volume 64, issue 5, September 2009. Image analysis and image engineering in close range photogrammetry. Guest editors: Hans-Gerd Maas (Dresden University of Technology, Germany) and Thomas Luhmann (University of Applied Sciences Oldenburg, Germany). Published in volume 64, issue 3, May 2009. Remote Sensing and GIS for Coastal Ecosystem Assessment and Management. Guest editor: Xiaojun Yang (Florida State University, U.S.A.). Published in volume 63, issue 5, September 2008. Guest editors: Derek Lichti (Curtin University of Technology, Australia), Norbert Pfeifer (Vienna University of Technology, Austria), and Hans-Gerd Maas (Dresden University of Technology, Germany). Published in volume 63, issue 1, January 2008. From Sensors to Systems: Advances in Distributed Geoinformatics. Guest editors: Peggy Agouris (University of Maine, U.S.A.), Matt Duckham (University of Melbourne, Australia), and Arie Croitoru (University of Maine, U.S.A.). Published in volume 62, issue 5, October 2007. Young author award papers of the Istanbul Congress. No guest editor. Published in volume 62, issue 2, June 2007. Airborne and spaceborne traffic monitoring. Guest editors: Stefan Hinz (Technical University Munich, Germany), Richard Bamler (German Aerospace Center, Germany), and Uwe Stilla (Technical University Munich, Germany). Published in volume 61, issue 3-4, December 2006. Guest editors: Christian Heipke (University of Hannover, Germany), John Mills (University of Newcastle, United Kingdom), and Karsten Jacobsen (University of Hannover, Germany). Published in volume 60, issue 6, September 2006. Extraction of topographic information from high-resolution satellite imagery. Guest editors: Manfred Schroeder (German Aerospace Centre, Germany), Clive Fraser (University of Melbourne, Australia), and Alain Baudoin (CNES, France). Published in volume 60, issue 3, May 2006. Advances in spatio-temporal analysis and representation. Guest editor: Donna J. Peuquet (The Pennsylvania State University, U.S.A.). Published in volume 60, issue 1, December 2005. Remote sensing and geospatial information for natural hazards characterisation. Guest editors: Earnest D. Paylor II (Pacific Disaster Center, U.S.A.), Diane L. Evans (Jet Propulsion Laboratory, U.S.A.), and David M. Tralli (Jet Propulsion Laboratory, U.S.A.). Published in volume 59, issue 4, June 2005. The U.V. Helava Award is awarded to authors of the best paper in the ISPRS Journal over a period of four years. The Best Paper Award of volume 135-146 (2018) was awarded to Steve Branson, Jan Dirk Wegner, David Hall, Nico Lang, Konrad Schindler and Pietro Perona for their paper "From Google Maps to a fine-grained catalog of street trees". The Best Paper Award of volume 123-134 (2017) was awarded to Davide Antonio Cucci, Martin Rehak and Jan Skaloud for their paper "Bundle adjustment with raw inertial observations in UAV applications". The Best Paper Award of volume 111-122 (2016) was awarded to Wei Huang and Songnian Li for their paper "Understanding human activity patterns based on space-time-semantics". The Best Paper Award of volume 99-110 (2015) was awarded to Devis Tuia, Rémi Flamary and Nicolas Courty for their paper "Multiclass feature learning for hyperspectral image classification: Sparse and hierarchical solutions". The Best Paper Award of volume 87-98 (2014) was awarded to Sven Oesau, Florent Lafarge and Pierre Alliez for their paper "Indoor scene reconstruction using feature sensitive primitive extraction and graph-cut". The Best Paper Award of volume 75-86 (2013) was awarded to Andrés Serna and Beatriz Marcotegui for their paper "Urban accessibility diagnosis from mobile laser scanning data". The Best Paper Award of volume 67-74 (2012) was awarded to Gerhard Gröger and Lutz Plümer for their paper "CityGML – Interoperable semantic 3D city models". The U.V. Helava Award for the period 2008-2011 was awarded to Konrad Schindler, Andreas Ess, Bastian Leibe and Luc Van Gool for their paper "Automatic detection and tracking of pedestrians from a moving stereo rig". The U.V. Helava Award for the period 2004-2007 was awarded to Martin Raubal, Stephan Winter, Sven Teßmann, and Christian Gaisbauer for their paper "Time geography for ad-hoc shared-ride trip planning in mobile geosensor networks". The U.V. Helava Award for the period 2000-2003 was awarded to Changno Lee and James S. Bethel for their paper "Extraction, modelling, and use of linear features for restitution of airborne hyperspectral imagery". The U.V. Helava Award for the period 1996-1999 was awarded to Martina Sinning-Meister, Armin Gruen, and Hanbin Dan for their paper "3D City Models for CAAD-Supported Analysis and Design of Urban Areas". January 2013: The Journal will now be published twelve times per year in twelve Volumes. September 2012: Sanna Kaasalainen of the Finnish Geodetic Institute has been appointed as additional associate editor. January 2012: Lalit Kumar of the University of New England and Dar Roberts of the University of California, Santa Barbara have been appointed as additional associate editors. November 2011: Konrad Schindler of the ETH Zürich has been appointed as additional associate editor. Feburary 2009: Daniel L. Civco of the Connecticut University has been appointed as additional associate editor. January 2009: Qihao Weng of Indiana State University succeeded Ling Bian as associate editor of the ISPRS Journal. January 2009: Under the new contract between ISPRS and Elsevier for the years 2009-2012, the ISPRS Journal will increase the number of published articles by around 57%. See the editorial of issue 64/1 for further information. January 2006: Ling Bian of the State University of New York at Buffalo succeeded Marguerite Madden as associate editor of the ISPRS Journal. December 2005: The Artwork Quality Control Tool is now integrated in EES. As soon as you upload artwork, this tool will check if the quality meets the requirements outlined in the Artwork Instructions. March 2005: As of March 14, the Elsevier Editorial System (EES) is available for paper submission (http://ees.elsevier.com/photo). EES replaces Elsubmit and enables completely web-based paper submission, paper reviewing, and communication with authors and reviewers. January 2005: After serving the ISPRS Journal for eight years, Manos Baltsavias turned over the position of Editor-in-Chief to George Vosselman. At the same time Marguerite Madden and Eberhard Gülch joined the journal as additional Associate Editors. July 2004: The Helava Award for the period 2000-2003 has been presented to Changno Lee and James S. Bethel. January 2004: Olaf Hellwich joined the journal as Associate Editor. May 2003: Elsevier now provides in electronic form the full text of all journal issues back to volume 1 published in 1965 (called Photogrammetria up to September 1989).